feeling stitchy: Feeling Stitchy this year? Giveaway! I've been giving a lot of thought to what I would like to do on Feeling Stitchy this year. Last year, cancer and chemotherapy slowed my schedule, but I realized, not in a bad way. Everything I've been through made me re-evaluate the direction of all my time, including this blog. As you know, I volunteer my time here, along with our other volunteer bloggers, and aside from receiving free items, Amazon Associates credits, or books for review, I am not paid for any of the writing and crafting I do. Evaluating the focus of my time helped me decide to delete our Facebook Feeling Stitchy page - mainly because I was deleting my personal FB account, but also because I want to cut back on our social presence so that the areas where we are present, can be a richer, more community-filled experience. I've been very inspired by the wonderful community on Instagram, and as Flickr goes to a paid format this year, (there are few of you who may remember we began our crafting community on Flickr) I'd like to shift our focus to Instagram rather than Flickr or Facebook. I've decided that the best thing about Feeling Stitchy all along, and what I most want to promote, is our shared community as stitchers. This year, I want to slow my focus, and work on projects that engage me, and hopefully all of you as well. In the past, I did features like "Wonderful Wednesday" at a fast pace - featuring a different Etsy shop or pattern every week at times. What was missing was my own stitching element, as I rarely had time to stitch the patterns I featured. 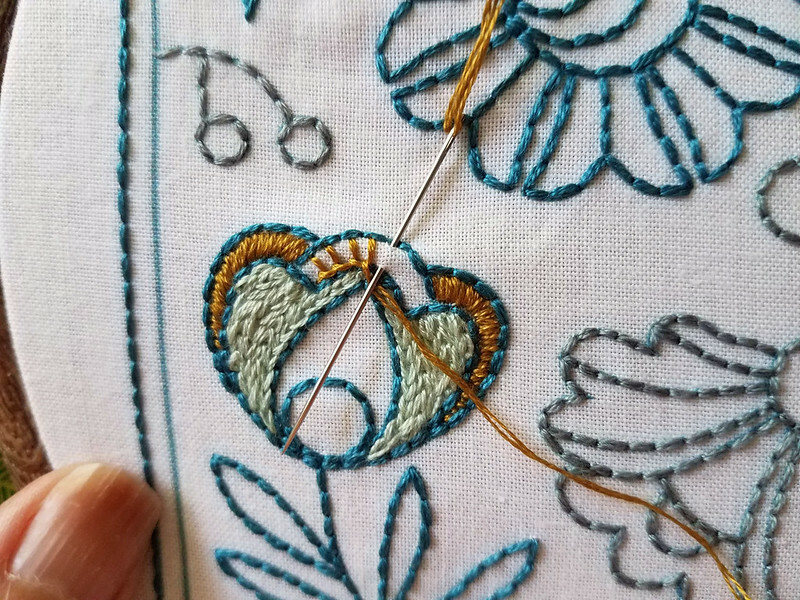 My new feature for the year will be called Project a Month, and in it I will feature a pattern from an Etsy shop or online store, and share my stitching experience with you. I want to engage with the seller and each pattern in a more in-depth way, my main goal is to explore what sets this pattern and shop apart, and to encourage and promote small business designers who work on Etsy and elsewhere. I'd love for you to stitch along with me but that's not required! In the end, if I inspire you to stitch, buy from a small business, leave a comment, or just get inspired period, I'll have done what I set out to do. My main goal this year is this idea of thinking SMALL instead of big. In my hometown, we have very few craft and yarn stores left, and we are down to 2 bookstores that sell new books, and very few used bookstores as well. So this year, another goal of mine is to think small - to try my best to buy items in person rather than online- if I can, I'll buy at a small business, local business, or a local store. I'd also like to buy more patterns from small businesses with Etsy shops or online stores. This year, I'd really like to explore this idea of thinking small, as a way to enrich our communities. Okay, now for the giveaway! Please leave feedback on this post on any of the things I mentioned above, and tell me what you would like to see on Feeling Stitchy this year? Is there a book, pattern, or seller you'd like us to feature? The winner of this giveaway will receive the craft or embroidery-themed book of their choice on Amazon OR the Etsy pattern of their choice - you choose! Please tell me in the comments which prize you would prefer, and what Amazon book or Etsy pattern you would like as your prize! Leave a comment on this post by February 7, 2019, when I will choose 1 random winner.